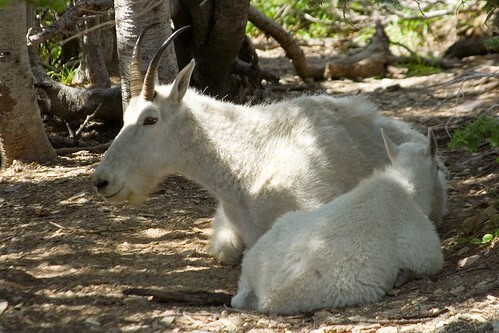 We passed this mother and her baby along our hike up to Hidden Lake. This pair was not far off the trail (just a few feet), and as with most of the wildlife we saw at Glacier a fairly large crowd gathered to watch and take photos. She seemed unconcerned with the presence of so many people. But on our way back to the Visitor Center, we noticed that she had relocated to a more secluded spot. This entry was posted on August 13, 2008 at 11:22 am and filed under animal, Glacier, Glacier National Park, Going-to-the-Sun Road, Hidden Lake, hike, horns, Logan Pass, Montana, mountain goat, National Park, trail, vacation, wildlife.